Een complot rond Malaysia Airlines vlucht 370? Tja ik kon er niet aan voorbij gaan en zo maar deze übernieuwe conspiracy aan me voorbij laten gaan zonder het hier te delen met jullie allemaal op QFF. Er zijn namelijk aan aantal opmerkelijke zaken omtrent vlucht 370 van Malaysia Airlines. • Feit # 1: Alle commerciële Boeing 777 toestellen zijn namelijk uitgerust met een black-box recorder die elke on board explosie moet kunnen overleven zonder beschadigd te raken. • Feit # 2: Elke Black Box blijft zo'n 30 dagen lang een signaal afgeven ook als de blackbox in zee of oceaan geflikkerd is. • Feit # 3: De meeste onderdelen van een in zee gestort vliegtuig zinken niet maar blijven gewoon drijven in water. • Feit # 4: Als een raket het toestel uit de lucht gehaald zou hebben zou die raket op de radar een signaal hebben afgegeven en zou daarmee dan dus automatisch zichtbaar moeten zijn geweest. • Feit # 5: De locatie van het vliegtuig op het moment van het verdwijnen van de radar was / is bekend, dus men zou technisch gezien moeten weten waar men moet zoeken. • Feit # 6: Als het toestel gekaapt zou zijn, zou het niet van de radar verdwenen zijn. It has been nearly two days since Malaysia Airlines Flight MH370 and all 239 passengers, including three Americans, on board mysteriously disappeared off the radar above the South China Sea. No distress signals were sent, and no signs have been found of the Boeing 777 airplane, which boasted a near perfect safety record, according to baffled aircraft experts. Throughout history, numerous incidences of planes vanishing into thin air have captured the attention of the public, aviation experts, and filmmakers alike. Many of the mysteries were solved only after the recovery of the plane's black box, which records flight data and cockpit voices. As search and rescue teams race against time to search for the Malaysian Airlines plane and its passengers, we look at five notorious airplane mysteries that were equally perplexing to investigators early on, some remaining unresolved to this day. Beijing - The mystery surrounding the disappearance of Malaysia Airlines Flight MH370 has thickened somewhat as family members of passengers have reported mobile phones ringing, but nobody answering. International Business Times reports that 19 families have signed a joint statement saying that passengers' cell phones connected after the flight had been reported missing. In each case, the phone would ring, but the call would be hung up. The sister of one of the Chinese passengers among the 239 people on board the missing flight rang his phone live on TV twice at 11:40 on Sunday morning and heard it ringing. She called again later that afternoon and heard it ring once more. The Mirror reports that she expressed her hope that if the call went through, police could locate the position. A man from Beijing also called his missing brother, and reported to the airline that the phone connected three times and rang before appearing to hang up. Relatives who signed the joint statement have asked Malaysia Airlines to reveal any information they may have been hiding. The airline has not released any further details regarding the aircraft, however Malaysian Minister of Transport Hishammuddin Hussein said they were doing everything in their power to locate the plane and that they hope people understand that they are being as transparent as they can. In the mean time, it has also been reported that the large oil slick spotted in the South China Sea, was found to be bunker fuel and not that of missing Malaysia Airlines flight MH370. These eerie happenings have, of course, given rise to a number of conspiracy theories, one of which purports that the aircraft may have been hijacked by terrorists bearing fake passports and is now secretly stationed at an abandoned Vietnamese airport at this very moment. According to 'citizen news' site Beforeitsnews.com, the aircraft may have been landed safely by terrorists/hijackers to later be used as a ‘weapon of mass destruction’ with passengers and crew now being held as hostages. New York Daily News reports that other theories suggest that the 100-ton Boeing 777 carrying 239 people simply disintegrated in the air at 35 000 feet, possibly due to an explosion. According to Scott Hamilton, a US-based aviation expert, the plane had been inspected just 10 days before and found to be in a 'proper condition,' meaning that it was highly unlikely that an explosion would have been caused by an aircraft fault. He added that the airplane could only have been torn apart by a completely unexpected catastrophic event or a criminal act. Some of the crazier conspiracy theories, cited by examiner.com, suggest that the plane could have been intercepted by a visiting alien UFO or transported to another world via an outer space wormhole. Laughable to many, but you have to admit that as the days tick by and no conclusive reports on the airplane's fate have been released, the incident is starting to look a lot like an X-Files case. It is being reported today, March 9, by the Singapore press in The Sunday Times that a Chinese family has successfully dialed and rang the mobile cell phone of a passenger on board the Malaysia Airlines plane MH370. This story has been followed by several other accounts of the same scenario withing different families. The Boeing 777 jumbo jet is still missing with no wreckage debris anywhere to be found. While news agencies around the world are focused on very few details surrounding the alleged unexplained oil slick in the China Sea and the search and recover efforts there, no official outlets are discussing the possibility that the plane has landed undetected somewhere on land. The fuel found on the ocean could have been anything such as a fuel dump. If the plane actually exploded in air, wouldn't the fuel have been burned up? Wouldn't a satellite somewhere have picked up the fiery display? Many agencies have now begun to use the term “vanished” or even “disintegrated” to describe the lost airline jet. Oddly, there is no word yet on any government agency action to search out possible landing strips, where the plane could have landed and received refuge and concealment. This theory holds more weight the longer the search efforts come up empty handed. Several reports that a possible airplane door was found in the ocean near the plane’s path have been squelched after the U.S. search team confirmed the floating debris was not related to the Malaysian flight MH370. At this stage of the unbelievable vanishing airplane story, many on social media are even suggesting that the plane has been intercepted by a visiting alien UFO or transported to another world via an outer space wormhole. However, as we hear many times in life, anything is possible. This could in fact be some sort of alien abduction. Whatever the answer is to the plane’s current whereabouts or fate, there must be a serious link to its disappearance and those 4 suspect passengers who used stolen passports to board the aircraft. We hope more shall be revealed soon, but until then, we suspect the plane is intact somewhere and the passengers alive. This whole missing Malaysia flight nightmare is looking more and more to be right out of an episode of "The X Files." Perhaps the passengers are on some faraway planet in an alternate galaxy or in some underground covert airplane hangar hideaway being held against their will by terrorists or otherworldly aliens. To keep the public calm and quiet, wreckage parts may be discovered on the shores of Vietnam soon, strategically placed. (NaturalNews) There are some astonishing things you're not being told about Malaysia Airlines Flight 370, the flight that simply vanished over the Gulf of Thailand with 239 people on board. The mystery of the flight's sudden and complete disappearance has even the world's top air safety authorities baffled. "Air-safety and antiterror authorities on two continents appeared equally stumped about what direction the probe should take," reports the Wall Street Journal. "For now, it seems simply inexplicable," said Paul Hayes, director of safety and insurance at Ascend Worldwide, a British advisory and aviation data firm. While investigators are baffled, the mainstream media isn't telling you the whole story, either. So I've assembled this collection of facts that should raise serious questions in the minds of anyone following this situation. No explosion from the plane itself can destroy the black box recorders. They are bomb-proof structures that hold digital recordings of cockpit conversations as well as detailed flight data and control surface data. Yet the black box from this particular incident hasn't been detected at all. That's why investigators are having such trouble finding it. Normally, they only need to "home in" on the black box transmitter signal. But in this case, the absence of a signal means the black box itself -- an object designed to survive powerful explosions -- has either vanished, malfunctioned or been obliterated by some powerful force beyond the worst fears of aircraft design engineers. In past cases of aircraft destroyed over the ocean or crashing into the ocean, debris has always been spotted floating on the surface of the water. That's because -- as you may recall from the safety briefing you've learned to ignore -- "your seat cushion may be used as a flotation device." Yes, seat cushions float. So do many other non-metallic aircraft parts. If Flight 370 was brought down by an explosion of some sort, there would be massive debris floating on the ocean, and that debris would not be difficult to spot. The fact that it has not yet been spotted only adds to the mystery of how Flight 370 appears to have literally vanished from the face of the Earth. One theory currently circulating on the 'net is that a missile brought down the airliner, somehow blasting the aircraft and all its contents to "smithereens" -- which means very tiny pieces of matter that are undetectable as debris. The problem with this theory is that there exists no known ground-to-air or air-to-air missile with such a capability. All known missiles generate tremendous debris when they explode on target. Both the missile and the debris produce very large radar signatures which would be easily visible to both military vessels and air traffic authorities. Air traffic controllers have full details of almost exactly where the aircraft was at the moment it vanished. They know the location, elevation and airspeed -- three pieces of information which can readily be used to estimate the likely location of debris. Remember: air safety investigators are not stupid people. They've seen mid-air explosions before, and they know how debris falls. There is already a substantial data set of airline explosions and crashes from which investigators can make well-educated guesses about where debris should be found. And yet, even armed with all this experience and information, they remain totally baffled on what happened to Flight 370. Hijacking an airplane does not cause it to simply vanish from radar. Even if transponders are disabled on the aircraft, ground radar can still readily track the location of the aircraft using so-called "passive" radar (classic ground-based radar systems that emit a signal and monitor its reflection). Thus, the theory that the flight was hijacked makes no sense whatsoever. When planes are hijacked, they do not magically vanish from radar. The inescapable conclusion from what we know so far is that Flight 370 seems to have utterly and inexplicably vanished. It clearly was not hijacked (unless there is a cover-up regarding the radar data), and we can all be increasingly confident by the hour that this was not a mid-air explosion (unless debris suddenly turns up that they've somehow missed all along). The inescapable conclusion is that Flight 370 simply vanished in some way that we do not yet understand. This is what is currently giving rise to all sorts of bizarre-sounding theories across the 'net, including discussions of possible secret military weapons tests, Bermuda Triangle-like ripples in the fabric of spacetime, and even conjecture that non-terrestrial (alien) technology may have teleported the plane away. Personally, I'm not buying any of that without a lot more evidence. The most likely explanation so far is that the debris simply hasn't been found yet because it fell over an area which is somehow outside the search zone. But as each day goes by, even this explanation becomes harder and harder to swallow. The frightening part about all this is not that we will find the debris of Flight 370; but rather that we won't. If we never find the debris, it means some entirely new, mysterious and powerful force is at work on our planet which can pluck airplanes out of the sky without leaving behind even a shred of evidence. If there does exist a weapon with such capabilities, whoever control it already has the ability to dominate all of Earth's nations with a fearsome military weapon of unimaginable power. That thought is a lot more scary than the idea of an aircraft suffering a fatal mechanical failure. SEPANG - Malaysian Youth Council (MAB) presented 500 stalks of roses to Malaysians Airlines (MAS) support staff, crew, Immigration officers and media personnel here at the Anjung Tinjau in Kuala Lumpur International Airport. This was to show appreciation and support for their dedication and hard work throughout the last three days since the news of the missing flight broke on Saturday. Council vice president, Law Eng Tack urged Malaysians to be united in spirit and extend their gratitude to their endless efforts in handling the delicate and difficult situation. "It's our duty to also acknowledge the work and the sacrifices of the people behind the scene who are working around the clock," he said, adding that the flower symbolises hope and love. Further, MAB members nationwide will also be performing solat hajat for the safe return of the passengers and crew members of flight MH370. Some of 100 members from the council, including culinary arts students from Butter and Olive College in Petaling Jaya who cooked and packed meals for the airport staff. SEPANG - As the search and rescue (SAR) operations to locate the missing Boeing 777-200ER enter its third day today, the authorities have yet to make any headway in finding the ill-fated aircraft. Addressing reporters here this morning, Department of Civil Aviation Director-general Datuk Azharuddin Abdul Rahman said the SAR teams were still working round the clock and comb the seas. "Unfortunately, we have not found anything any objects belonging to the aircraft, let alone the plane itself," he said, adding that SAR efforts were intensifying. On the reports of two oil slicks found on the southern tip of Vietnam, Azharuddin said samples of the oil had been sent to the Chemistry Department. "We hope the oil belongs to the missing aircraft," he said, adding that no objects belonging to the plane had been recovered by the SAR teams. Responding to reports that the Vietnamese team had spotted an object resembling a "door" belonging to the aircraft, Azharuddin categorically denied it. "No object was picked up. There was another report claiming that the tail of the plane was found, but they were only logs tied together." He also did not entertain questions pertaining to ongoing investigations on a possible hijacking, saying he did not want to "compromise the investigation". He also assured the public that security at the Kuala Lumpur International Airport was not in question as it met international security standards. KELANTAN - A businessman in Ketereh claimed that he saw a bright white light, believed to be of an aircraft, descending at high speed towards the South China Sea about 1.45am on the day flight MH370 went missing. Alif Fathi Abdul Hadi, 29, told the New Straits Times what he saw after lodging a report with the Malaysian Maritime Enforcement Agency (MMEA) in Tok Bali earlier today. Alif said he was in the compound of his home when he saw the bright white light, which he described as similar to the ones used by airplanes during night flights. "I was walking towards my back door when I caught a glimpse of the white light. "It was moving towards the sea, towards Bachok area, which was unusual. "Usually, aircrafts that fly over here have their usual route pattern, but this one went completely towards the other way," he said. Alif said he watched the light's movement for about five minutes, before realising that it was descending. However, he said he was not sure that it was an airplane as he only saw the light. He said there was no blinking red light. "I did not think much about it, and went to sleep. "Only the next day, when I heard the news on the radio, I thought that the light I saw could be from the aircraft's. "After discussing with my family members, they advised me to lodge a report, and I hope this information can be of any help," he said. Alif was accompanied by his uncle Rosman Ishak, 55, when he lodged the report. Department of Civil Aviation's Datuk Azharudin Abdul Rahman said the agency is considering all possibilities in investigating the missing flight MH370 case. Among these possibilities include mid-air disintegration, a hijack, air turn-back and the plane is crashed. "We are not ruling out any possibilities and we are investigating all of these, but we can't give any confirmation yet as there has yet to be any hard evidence to determine what actually happened to the aircraft," said Azharudin. On the two passengers traveling with fake passport, the authorities are currently looking into claim. Relevant records are being evaluated and video footages examined. “We can’t reveal too much as we are still investigating,” said Azharudin. DCA's Datuk Azharudin Abdul Rahman said the object that was spotted by two aircrafts which looked like the tail of an aircraft was actually logs. "When we sent a team to check it out, the object was actually just logs," he said. Updating on the oil slicks, Azharudin said that the oil sample was sent to a lab and and results have yet to surface. Azharudin told the the media they will be informed once the lab results are out. MAS Flight MH370 has gone missing more than 60 hours now and patience is running low with many demanding answers for what had happened to the flight. In a press conference conducted at 12pm just now, Department of Civil Aviation's Datuk Azharudin Abdul Rahman said the authorities have yet to give any confirmation as they do not have any hard proofs to back any of the claims. ""We are equally puzzled with what happened, together with the experts and the Prime Minister even used the term 'perplexing' to describe this incident. "However, we still need hard evidence to determine what happen to the aircraft," Azharudin said. All search and rescue teams are currently conducting thorough rescue and search operation and they have widen the search area in the South China Sea, where the location of the aircraft was last seen. "We have also conducted search around the North Straits of Malacca too," said Azharudin. To date, local authorities have received the co-operation from neighbouring countries who had sent various large assets among which are several aircrafts, ships and personnel members. The countries that have joined forces to help the seacrh and rescue mission are Vietnam, China, Singapore, Indonesia, the United States, Thailand, Australia and the Phillipines. In the press conference, Azharudin responded well to the media. He explained the search by air is being done daily from 7am to 7pm while the ship search is being carried out throughout the night. Despite the throrough search and rescue mission, the uncertaities remain. "We have yet to find anything yet. There was a Vietnamese report claiming that they have indentified an object that appeared to look like the door of an aircraft. But this was not the case," said Azharudin. SEPANG: The family members of the Chinese passengers of Flight MH370 arrived at Kuala Lumpur International Airport this morning from Beijing. Upon arrival at the airport, they were received by officials from MAS. The family members flew to Malaysia to obtain the latest updates on the situation. MAS Flight MH370, carrying 227 passengers, including two infants, and 12 crew, went missing en route from Kuala Lumpur to Beijing about an hour after taking off from KLIA at 12.40am Saturday. MELBOURNE: Australia this morning sent a second RAAF aircraft from Darwin to join the search for a Malaysia Airlines Boeing 777-200ER that has been missing since early Saturday. Australia sent an RAAF AP-3C Orion last night and a second aircraft left Darwin at 8.30am (AEDT) today, the Australian Associated Press reported. Air Marshal Mark Binskin said the maritime patrol and long-range surveillance aircraft were equipped with sensors and electro-optic detectors that were ideal for the operation. There are 18 Australian crew on board each RAAF jet. Six Australians and two New Zealanders, one of whom lives in Perth, were on the MAS plane that disappeared over the South China Sea early Saturday morning, one hour into what should have been a six-hour flight from Kuala Lumpur to Beijing. Authorities are examining links to terrorism as two of the flight’s 227 passengers were found to have used stolen passports. Australian Foreign Minister Julie Bishop has been in touch with her Malaysian counterpart to offer Australia’s support. She said the reports of stolen passports were concerning. “There may be no connection at all but it is a worrying development,” Bishop told ABC radio today. Malaysia has set up a rescue co-ordination centre and dozens of ships and aircraft were looking for the missing aircraft, she said. China, the Philippines, Singapore, the United States and Vietnam have also sent resources to join the search. Families of the Australians on board were receiving consular assistance, Bishop said. MAS Flight MH370, carrying 227 passengers, including two infants, and 12 crew, went missing en route from Kuala Lumpur to Beijing about an hour after taking off from the KL International Airport at 12.41am on Saturday. It should have landed in Beijing at 6.30am. KUALA LUMPUR: Prime Minister Datuk Seri Najib Razak today pledged that the government would do its best in the search and rescue (SAR) operation for the Malaysia Airlines (MAS) flight MH370, which was reported missing on Saturday. “I assure you we are doing everything possible within our means. “We thank you for your prayers, assistance and show of solidarity,” Najib said in his Twitter account tonight. Meanwhile, in his other tweet earlier, Najib said when Malaysia faced difficulties many countries came forward and offered assistance in the name of friendship. “In our time of need, friendship has come in many forms. We will continue our efforts to search for MH370,” the prime minister said. Among the countries that offered assistance to Malaysia were China, Vietnam, the Philippines, Singapore, Indonesia, Australia as well as the US. The MAS MH370 flight, carrying 227 passengers and 12 crew, went missing en route from Kuala Lumpur to Beijing about an hour after taking off from the KL International Airport at 12.41am Saturday. It should have landed in Beijing at 6.30am the same day. PUTRAJAYA: As night fell on the second day of the search for flight MH370, the lobby of The Everly Hotel was heavy with the weight of solemn yearning by relatives of the passengers of the missing plane. People who were once strangers stood around talking about their loved ones, asking about each other’s families as they continued to hope for the best. The buzz generated by the throng of journalists looking to speak to distraught family members earlier in the day had quietened down, as most joined those gathered in the hotel to quietly watch the news on television to get a rundown on the day’s events. And all the while, volunteers from Malaysia Airlines’ emergency operations centre (EOC) continued their vigil as they remained at the ready to assist anxious relatives waiting for any news on the missing passengers. It had been a hard day all round, and clearly a challenging time for the volunteers as they tried their best to manage the crush of media workers camped out at the hotel lobby and raging tempers of some family members who were unhappy with the lack of information coming their way. Even as one relative angrily shoved away a volunteer who tried to stop a group of journalists from interviewing him, they could only ask for everyone’s co-operation and try their best to keep the peace. A volunteer later explained that while they were not given orders to bar family members from speaking to the media, they were advised to minimise contact between worried relatives and journalists looking for stories. This was to avoid fanning already high emotions. Though the day had since wound down for most at the hotel, the volunteers remained on duty, periodically checking on how the family members were holding up and making sure they were comfortable. “Regardless of whether we know the crew on the missing plane or not, we are now in crisis mode and we just have to do our jobs,” a senior company executive on the EOC said when contacted, referring to the 12 crew members on board flight MH370. The senior executive, who declined to be named, noted that once Code Red is activated, volunteers are put on 24-hour shifts wherever they are required to provide whatever assistance they can. This applied to the group of 90 over GoTeam volunteers who landed in Beijing yesterday morning, as with the EOC volunteers stationed at The Everly and the Kuala Lumpur International Airport. “There is no fixed pattern for the shifts, but it will be at least 24 hours. As long as we are in crisis, we will just keep going... it will be a long period for all of us,” the executive added. The fate of the 239 lives onboard the missing Boeing 777-200 remains unknown, as over 80 maritime vessels and aircraft were dispatched by Malaysian, Singaporean, Chinese, Vietnamese, American and Australian authorities to help the search and rescue operations. Full search and rescue efforts resumed at first light today. PUTRAJAYA: An internal investigation on the Immigration Department has commenced following reports that two passengers were using stolen passports to board the missing Malaysia Airlines (MAS) flight MH370. Home Minister Datuk Seri Ahmad Zahid Hamidi said the detailed investigation would give special attention to the department’s Kuala Lumpur International Airport (KLIA) branch. “We will conduct an internal probe, particularly on the officers, who were on duty at the KLIA Immigration counter during flight MH370. “I am still puzzled how come (immigration officers) cannot think, an Italian and Austrian (passengers) but with Asian facial features,” he told reporters at the Kembara Bumi Suci 2014 convoy participants meeting with Prime Minister Datuk Seri Najib Razak at Seri Perdana here yesterday. Ahmad Zahid said the investigation was conducted by a special team, led by Immigration Department Director-General Datuk Aloyah Mamat. Currently, no conclusion could be made pertaining to the issue as the investigation had only commenced once the actual passport holders claimed that their passports were stolen, he said. Ahmad Zahid said it was difficult to determine the authenticity of an international passport that was being brought by a passport holder because not all countries used the biometric system and bar code as in Malaysia. Civil Aviation Director-General Datuk Azharuddin Abdul Rahman in a media conference in Sepang yesterday that only two passengers had false passports to board flight MH370, which was its way from Kuala Lumpur to Beijing. Both passengers involved had used the Italian and Austrian passports. Flight MH370, with 227 passengers, including two infants, and 12 crew members was reported missing from the radar at 1.30am on Saturday, about an hour after departing from KLIA. The plane carried passengers from 14 countries, including 153 Chinese and 38 Malaysians. PETALING JAYA: FLIGHTRADAR24 (FR24) chief executive officer Fredrik Lindahl said Malaysian authorities could have conducted precise search and rescue operations if they had noted MH370 dropping from the radar after 40 minutes and not after two hours. Malaysia Airlines (MAS) only confirmed Flight MH370’s disappearance after 15 hours at 10pm on Saturday, the last reported position by FR24 showed. “We were not aware of the situation until MAS went public with a statement after five hours,” he said. “At that point we could only check our historic data for the flight. “Unfortunately, there’s no way for us to tell when an accident has happened. “FR24 is not affiliated with any emergency agencies because we only function as a real-time flight tracking service. 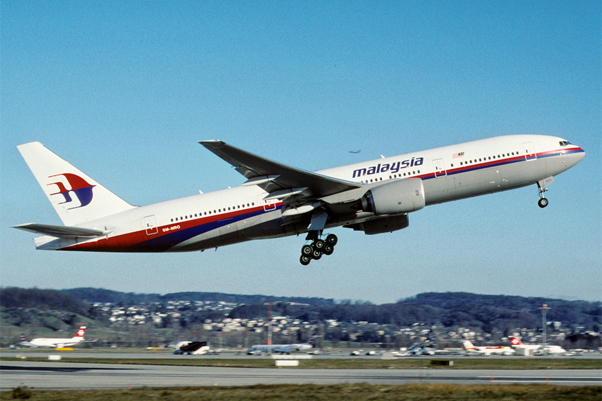 The MAS Boeing 777 flight was reported missing between Malaysia and Vietnam. The aircraft took off from Kuala Lumpur at 16.41 UTC time (12:41am Malaysian time) on Saturday and disappeared from Flightradar24 at 17.20 UTC (1.20am). At 23.24 UTC (7.24am) MAS said the aircraft had lost contact with air traffic control at 18.40 UTC (2.40am) — two hours after take-off. It took 11 hours until a search and rescue operation was started in the areas surrounding the Gulf of Thailand at 03.00 UTC (10pm), where Flightradar24 reported it lost radar contact. “This incorrect time report made the media speculate all night about a crash in the jungle somewhere between Vietnam and China,” Lindahl said. Flightradar24 is a flight tracking service that provides real-time information on thousands of aircraft around the world. Its services are available online and through mobile phone apps. Boeing declined to provide any statement regarding its efforts. It released a press statement on Saturday, in which it offered its deepest concern to families of those onboard MH370. It also stated that Boeing will provide the US National Transportation Safety Bureau (NTSB) with technical advisers, who are en route to offer assistance. NEW YORK: The FBI has not sent agents to Kuala Lumpur to assist in the investigation of a Malaysian Airlines plane that went missing on Saturday, according to a senior US law-enforcement official, though representatives from other US agencies and plane-maker Boeing are expected to arrive today. The plane, a 777-200ER, disappeared suddenly, and though no wreckage has been found, the 239 passengers and crew aboard flight MH370 are presumed dead. So far, Malaysia has not asked for help from the FBI or the Department of Homeland Security, and the agencies have not sent investigators, a second official said. The officials spoke on condition of anonymity because of the sensitivity of the subject. The FBI and other US law-enforcement agencies have offered to help, the second official said, and they have forensic and analytic tools and criminal investigation expertise that likely could help the probe. Because no wreckage has been located, the legal jurisdiction for the crash has not been determined and no government or agency is formally in charge. On Saturday, a small team of experts from the National Transportation Safety Board, Federal Aviation Administration and Boeing departed for Kuala Lumpur and were expected to arrive there today. That team also has not been formally invited to participate, because no authority has taken charge of the investigation yet. "It's a small team," said NTSB spokeswoman Kelly Nantel, declining to give a precise number. "Just enough to have some boots on the ground to be able to mobilise quickly if they're able to locate the aircraft." The FAA said one of its staff was on the team. Boeing declined repeated requests for comment. Officials investigating the disappearance suspect the plane may have disintegrated in mid-flight, a senior source close to the investigation said on yesterday, as Vietnam reported a possible sighting of wreckage from the plane. Asked about the possibility of an explosion, such as a bomb, the source said there was no evidence yet of foul play and that the aircraft could have broken up due to mechanical causes. An authoritative US government source said the United States has extensively reviewed imagery taken by its spy satellites for evidence of a mid-air explosion, but seen none. The source said US satellite coverage of the region is thorough. But the source indicated this did not categorically rule out an explosion. KUALA LUMPUR: Over 50 hours have passed since MH370 was reported lost from radar and still, there is little to go on. Intensive, round-the-clock efforts by an army of rescue workers from at least seven countries, manning as many as 72 vessels by air and by sea have failed to turn up a single indication that the Boeing B777-200 aircraft carrying a staggering 239 people had crashed. There has been no confirmed signs of wreckage or debris, no distress signal from the aircraft before it lost contact with ground control, and no clear indication that the plane had experienced any technical failure in mid-air. During take-off at 12.41am on Saturday, weather conditions appeared normal. The aircraft, described as one of the “safest”, was said to be equipped with the ASD-B flight transponder, which transmits data on its altitude, speed and direction back to air traffic controllers every second. It also has the Emergency Locator Transmitter (ELT), which can be manually activated by the pilot or should transmit information on the aircraft’s location in the event of a crash. As such, if the plane was experiencing problems in mid-flight, it should have been able to transmit a distress signal back to ground control. The fact that this did not happen has led to speculation on the behaviour of the aircraft at the time it went missing. The Beijing-bound airship was piloted by 53-year-old Captain Zaharie Ahmad Shah, a man described by news reports as a “tech geek” so passionate about flying that he even practices on his own flight simulator at home. Zaharie has more than 18,600 flying hours under his belt in the three decades he has served MAS. Was MH370 Captain Zaharie’s last flight? If indeed the aircraft had disintegrated in mid-air due to mechanical failure, it would have happened so quickly that there was no time for the plane to inform ground control. Even so, there should be some semblance of debris in the water for rescuers to find. If indeed the aircraft had crashed into the ocean, search and rescue efforts should have turned up some telltale discoveries by now. If indeed the aircraft sank into the waters without leaving behind signs of wreckage, it would have taken some time before it disappeared completely from sight. Again, rescuers should have caught at least a glimpse of the airship before it went down. But Malaysians and the rest of the world woke this morning only to find out that search and rescue efforts, now entering into their third day, have turned up nothing. It was as if flight MH370 had vanished into thin air, taking with it the lives of 239 people. Without any sign of the missing aircraft, the only leads the authorities, and the watching world, have to go on are the many speculative, conspiracy theories that have emerged since MH370 disappeared from sight. Most significant are the reports alleging the possibility of terror links to some of those onboard the missing aircraft. It has been confirmed that two passengers were allowed to board the aircraft using the stolen passports belonging to one Italian and one Austrian national. Officials from the Federal Bureau of Investigation (FBI) touched down in Kuala Lumpur yesterday and met with Malaysian intelligence officers to investigate the possibility that a more serious security breach had led to MH370’s disappearance. According to Interpol, there were no checks on the two passports that were listed on its database between the time the documents were stolen and the flight’s departure. “Whilst it is too soon to speculate about any connection between these stolen passports and the missing plane, it is clearly of great concern that any passenger was able to board an international flight using a stolen passport listed in Interpol’s databases,” Interpol Secretary General Ronald Noble said in a statement, according to international news agency Reuters. Adding to the intrigue, Interpol said it has widened its probe to other suspect passports, “which may have been reported stolen”. “This is a situation we had hoped never to see. For years Interpol has asked why should countries wait for a tragedy to put prudent security measures in place at borders and boarding gates,” Noble was quoted as saying. According to CNN, the duo, who somehow gave local immigration officers the slip, appear to have bought their tickets together. The two tickets were bought from China Southern Airlines in Thai baht for identical prices and had contiguous numbers, the international broadcaster reported on its website yesterday, citing information from China’s official e-ticket verification system Travelsky. That the two tickets had adjoining numbers showed they were issued together, CNN said. The revelation is likely to deepen speculation of foul play over the missing plane. Malaysian authorities have also confirmed that two passengers had boarded the missing Beijing-bound flight under dubious identities. “There are only two passengers on record on this aircraft with false passports and we have the CCTV recordings of those passengers from check in, right to the departure point and this record of the CCTVs are now being used in investigations on this,” Department of Civil Aviation Director-General Datuk Azharuddin Abdul Rahman told reporters at the Sama Sama Hotel in Sepang earlier. Following these reports, talk of terrorism, bombing and hijacking of MH370 were bandied about repeatedly yesterday. According to Singapore’s The Straits Times yesterday, the authorities were not ruling out Uighur involvement in the mysterious disappearance of flight MH370. Quoting Malaysian officials familiar with the ongoing probe, the daily said investigators are keeping their minds open to the possibility. The daily noted that the plane’s disappearance had coincidentally come just a week after knife-wielding assailants killed nearly 20 people at a train station in Kunming, China. The killings have been linked to China’s Uighur Muslim minority group. “One of the Malaysian officials said the authorities were not ruling out Uighur involvement in the jet’s disappearance, noting that Uighurs were deported to China from Malaysia in 2011 and 2012 for carrying false passports,” ST reported. “This is not being ruled out. We have sent back Uighurs who had false passports before. It is too early to say whether there is a link,” one official was quoted as saying. ST reminded that in 2011, Malaysia had deported 11 Uighurs who were allegedly linked to a human trafficking syndicate. Back in Kuala Lumpur, the official line taken by Malaysian government and aviation officials was one of caution. Despite the authorities’ refusal to divulge more information, and the endless number of theories and uncertainties, however, only one thing has remained true so far — flight MH370 still remains missing. SEPANG: Tan Ku Leng said her husband, Stanley Wong Sai Sang, was not supposed to be on Flight MH370. She said Wong had missed an earlier flight and was forced to board the Malaysia Airlines plane that departed KL International Airport at 12.41am on Saturday. “He missed his flight last night (Friday) and bought another ticket to be on the next flight to Beijing,” Tan said at KL International Airport. She said Wong, a senior marketing manager, flew to Beijing with two colleagues to promote their company’s products. Former Selangor executive councillor Ronnie Liu was present to lend support to Wong’s family. He said he and Wong studied together at Sekolah Menengah Raub, Pahang. “I was attending a meeting in Shah Alam when I saw his name on the passenger list. I rushed to the airport to be with his family,” Liu said. PETALING JAYA: The family and relatives of inflight supervisor Patrick Francis Gomes continues to hope for his safe return. His cousin, Rachel Santa Maria, 50, said although what had happened was shocking and devastating for the family, they would not give up hope. “We refuse to accept the situation. We are waiting and praying and hoping for the best,” she said. Santa Maria said Gomes’s immediate family members had been staying at Sama-Sama Hotel at KL International Airport since Saturday as they await a flight out to a yet undisclosed location by Malaysia Airlines (MAS). “MAS has been doing a good job in providing food and meeting our needs,” she said. She said the congregation at St Francis Xavier Church in Petaling Jaya, where Gomes’s family attends weekly mass, had organised special prayers for the family as well as all the other passengers and crew members. “His wife and four children are in a fragile state. So we as the family can only pray and hope he returns safely,” she said. Many friends and family members showed their concern and support on Gomes’s Facebook wall. One message from Pius Eugene at 11am yesterday read: “My great friend from schooldays in Section 17 PJ. I was with him when he went for both interviews for his first job as a MAS flight attendant ... Whatever it is, God please keep him safe in your arms”. Gomes’s youngest daughter, Michelle Leigh, 23, thanked everyone on behalf of the family for their prayers and well wishes on her Facebook wall. “Hello everybody. Thank you so much for your warm wishes and prayers. My family and I are praying very hard and just hoping for the best. Thanks again,” she said. SEPANG: Lawyer Datuk David Gurupatham was unhappy when he had to change his flight to China over the weekend but it would be a decision he will never regret. The managing director and partner at law firm David Gurupatham and Koay was supposed to be on board Flight MH370 but was forced to take a later flight. “The initial plan was to board Flight MH370 but due to the lack of service, we decided to switch travel agents and could not reconfirm that same flight. We were angry that we had to board the later flight MH360,” he told The Malay Mail at KL International Airport where he was waiting to board the later flight. Gurupatham was joined by his friend Daniel Lai, 46, who was also supposed to board the same plane. Looking back on his other experiences, the lawyer has plenty to be thankful for. With all the close shaves he has had, he is definitely a “cat with nine lives”. The 46-year-old avid car enthusiast survived two high-speed crashes involving his Porsche and Ferrari. In 2009, he survived an emergency landing in Taiwan when Typhoon Marakot hit. And in 2012, he and Lai escaped the explosion at Lee Gardens Plaza Hotel in Haadyai, southern Thailand, which killed five people and injured more than 300. “We were stuck in traffic just five minutes away from Lee Gardens when the explosion happened,” he recalled. On his flight to Taiwan, Gurupatham said that the plane had swung so ferociously and he thought his time had come. “Thankfully the pilot was competent.” he said. PETALING JAYA: It was the phone call that the family in Ipoh had always worried about but on Saturday morning, it finally came through. Goh Sock Lay, 45, who is married to Choi Loong Choo, 47, was the chief stewardess on Flight MH370 and at 8am, that dreaded call was made to her in-laws’ house to inform them her plane was missing. “We had always feared about this moment but we never talked about it. We are all very sad,” said Goh’s sister-in-law, Choi Chew Heong. Chew Heong said that whenever Sock Lay was on duty, she would leave her daughter, Wei Ling, 16, at her house where Sock Lay’s father-in-law, Choi Tat Sang, 75, will help to take care of her. The family had tried to keep the news from Wei Ling until 2pm that day since the information had not yet been confirmed. “Wei Ling cried when she heard the news,” said Chew Heong. Another crew member of MH370, flight attendant Mohamad Hazrin Mohamed Hasnan, is expecting his second child in May. He and his wife, Intan Maizura Outhman, who is also a flight attendant, have a three-year-old daughter. Hazrin’s uncle, Mustapha Kamarudin, said Hazrin was a man of few words but was always cheerful and close to his sisters. “He has six sisters and he was very close to them,” he told The Malay Mail. Mustapha an executive sub editor with The Malay Mail said Hazrin, from Subang Jaya, usually flew on the European and Australian routes but had to replace a colleague on MH370. “He was supposed to be back on Sunday and fly off to Paris but he had to replace someone for that sector (China),” Mustapha said. Since there are no new developments, mD will end its live coverage for today. Stay tuned for more updates tomorrow at 9am. SEPANG - A shaman, claiming to be able to locate the missing MH370 jetliner, offered his expertise to help the authorities in their search. "I have been using my bubu (traditional fishing tool) and bamboo scopes to see the situation there, and I saw that the aircraft is currently suspended in mid air," he said. Ibrahim who claimed to have solved cases like the highland towers, mystery of villa Nabila, Mona Fandy and others, attracted a large crowd during his 'seeing' demonstration at the international arrival hall in Kuala Lumpur International Airport. SEPANG - Malaysian authorities today said they could conclusively say that the two passengers who boarded flight MH370 using stolen passports were not Asian, though it has not brought them any closer to discovering their identities. Department of Civil Aviation (DCA) director-general Datuk Azharuddin Abdul Razak said that investigators scrutinising the CCTV footage and screen captures of the two suspects confirmed that the suspects were not “Asian-looking” males. “Do you know a footballer named Balotelli? They look like that,” he said at the day’s last press conference, referring to Italian national striker Mario Balotelli, who was born in Italy to Ghanaian parents. KUALA LUMPUR - Rescue helicopters and ships searching for a Malaysia Airlines jet rushed Monday to investigate a yellow object that looked like a life raft. It turned out to be moss-covered trash floating in the ocean, once again dashing hopes after more than two days of fruitless search for the plane that disappeared en route to Beijing with 239 people on board. With no confirmation that the Boeing 777 had crashed, hundreds of distraught relatives waited anxiously for any news. Thai police and Interpol questioned the proprietors of a travel agency in the resort town of Pattaya that sold one-way tickets to two men now known to have been traveling on flight MH370 using stolen passports. There has been no indication that the two men had anything to do with the tragedy, but the thefts of the passports fueled speculation of foul play, terrorism or a hijacking gone wrong. Malaysia has shared their details with Chinese and American intelligence agencies. Malaysia’s police chief was quoted by local media as saying that one of the men had been identified. Civil aviation chief Azharuddin Abdul Rahman didn’t confirm this, but said they were of “non-Asian” appearance. He said authorities were looking at the possibility they were connected to a stolen passport syndicate, but declined to give any more details. The search operation has involved 34 aircraft and 40 ships from several countries covering a 50-nautical mile radius from the point the plane vanished from radar screens between Malaysia and Vietnam, he said. Experts say possible causes of the apparent crash include an explosion, catastrophic engine failure, terrorist attack, extreme turbulence, pilot error or even suicide. Selamat Omar, a Malaysian whose 29-year-old son Mohamad Khairul Amri Selamat was a passenger on the flight, expected a call from him at the 6.30 a.m. arrival time. Instead he got a call from the airline saying the plane was missing. “We accept God’s will. Whether he is found alive or dead, we surrender to Allah,” Selamat said. There have been a few glimmers of hope, but so far no trace of the plane has been found. On Sunday afternoon, a Vietnamese plane spotted a rectangular object that was thought to be one of the missing plane’s doors, but ships working through the night could not locate it. Then on Monday, a Singaporean search plane spotted a yellow object some 140 kilometers (87 miles) southwest of Tho Chu island, but it turned out to be some sea trash. Malaysian maritime officials found some oil slicks in the South China Sea and sent a sample to a lab to see if it came from the plane. Tests showed that the oil was not from an aircraft, Azharuddin said. As relatives of the 239 people on the flight grappled with fading hope, attention focused on how two passengers managed to board the aircraft using stolen passports. Interpol confirmed it knew about the stolen passports but said no authorities checked its vast databases on stolen documents before the jet departed. The two stolen passports, one belonging to Austrian Christian Kozel and the other to Luigi Maraldi of Italy, were entered into Interpol’s database after they were stolen in Thailand in 2012 and last year, the police body said. Electronic booking records show that one-way tickets with those names were issued Thursday from a travel agency in the beach resort of Pattaya in eastern Thailand. Thai police Col. Supachai Phuykaeokam said those reservations were placed with the agency by a second travel agency in Pattaya, which told police it had received the bookings from a China Southern Airlines office in Bangkok. The owners of the second Pattaya travel agency refused to talk to reporters. Thai police and Interpol officers went in to question the owners. A telephone operator on a China-based KLM hotline confirmed Sunday that passengers named Maraldi and Kozel had been booked on one-way tickets on the same KLM flight, flying from Beijing to Amsterdam on Saturday. Maraldi was to fly on to Copenhagen, Denmark, and Kozel to Frankfurt, Germany. As holders of EU passports with onward flights to Europe, the passengers would not have needed visas for China. Interpol said it and national investigators were working to determine the identities of those who used the stolen passports to board the flight. Interpol has long sounded the alarm that growing international travel has underpinned a new market for identity theft: Bogus passports are mostly used by illegal immigrants, but also pretty much anyone looking to travel unnoticed such as drug runners or terrorists. More than 1 billion times last year, travelers boarded planes without their passports being checked against Interpol’s database of 40 million stolen or lost travel documents, the police agency said. Azharuddin also said the baggage of five passengers who had checked in to the flight but did not board the plane were removed before it departed, he said. Airport security was strict according to international standards, surveillance has been done and the airport has been audited, he said. SEPANG: Twenty-five members of the MCA Crisis Relief Squad (CRSM) arrived at the Kuala Lumpur International Airport (KLIA) here this morning to assist family members of passengers on board flight MH370 which was reported missing on Saturday. The team was led by Datuk Yu Chok Tow who is also Head of the MCA President's Office. A source from the KLIA auxiliary police told Bernama that all the family members would be taken to the Everly Hotel near here but their numbers have not been verified. Set up in 2004, the CRSM had been involved in various local and international crisis aid missions such as tsunami and flood disasters. Meanwhile, reporters and cameramen were not allowed into the area believed to be the gathering point for family members of passengers on board flight MH370. The first group of family members from Beijing, China are believed to have arrived in KLIA at 8am today but a Malaysia Airlines (MAS) spokesman did not want to comment on it when contacted. Since 7am today, dozens of reporters and press photographers had gathered at the special staff walkway along the arrival hall on Level 3 of KLIA. Also seen were volunteers of the Malaysian Tzu-Chi Association who were taken to a crew briefing room, believed to provide support to the families of the passengers. Yesterday, MAS, in a statement issued in Beijing, said it would fly the first group of family members here to provide the latest information. PUTRAJAYA - Former Prime Minister Tun Dr Mahathir Mohamad said playing the blame game on the plight of the missing Malaysia Airlines aircraft will not help in solving the mystery of the incident. "Every unfortunate thing that happened is a lesson. I believe the authorities have done their best in the mission to search the missing airplane," he said. He said it is up to the authorities to deal with the matter when commenting on the issue of the questionable security level at Kuala Lumpur International Airport following the case of two fake passports. Mahathir, accompanied by his wife, Tun Dr Siti Hasmah was here at the Everly Hotel to visit the families of the passengers onboard of missing MH370 flight. Also present was his son, Kedah Menteri Besar Datuk Seri Mukhriz Mahathir, who was accompanied by his wife Datin Seri Norzieta Zakaria. Commenting on the current condition of the family members, he urged the social media users to be more sensitive when posting or commenting on the incident as their actions had deeply hurt them. "I met the families personally. They have expressed that they felt tortured by the little information that they got after been waiting for so long. "They also mentioned that preferrably, they do not want to get false information as they often disappointed by it after the official news announced the other way around. "Therefore, I hope the public, particularly the social media user can be more sensitive about this," he told reporters after visiting the family members of passengers onboard MH370. He also said that Kedahans will carry out solat hajat tonight to pray the best for the passengers. [UPDATE 8.27PM] It is still a search and rescue mission and not damage control. [UPDATE 8.26PM] The weather for the last few nights has been fair. It is hoped it will continue. [UPDATE 8.23PM] Vietnam media has reported what ever they found. But when ever Vietnam government contacted, they have denied. So people must not speculate. [UPDATE 8.15PM] There is still no confirmation that the debris is from aircraft. An answer should be availble by tommorrow. On the oil slip, the sample has been sent to chemistry department. The oil has been confirmed not to be from an aircraft. PUTRAJAYA - The Everly Hotel here today was abuzz with activities. Apart from government representatives and volunteers to provide moral support and assistance, former Prime Minister Tun Dr Mahathir Mohamad was also present to meet relatives of passengers of MH370. He spent some time talking to the relatives. One of the family members, Puvaneswary P.G. Soosai, described her cousin Puspanathan Supramaniam, 34, who was onboard the missing MH370 flight as a cheerful and friendly individual. "He is a good husband, a father and a friend to all of us. "It was a big test for the family since Puspanathan's absence three days ago since he was the main breadwinner." Stating that his destination to Beijing was for work purposes, Puvaneswary said as an IT engineer, his job requires him to 80 per cent travel overseas. She said the family remained positive despite waiting in the dark for the missing airplane. "We want him to come back as he had promised to celebrate his sister's birthday after his work is done," she said. Selamat Omar, 60, from Pahang said he was ready to accept whatever fate that befalls his son Mohd Khairul Amri Selamat. "We leave everything to Allah now. "I have already informed all my relatives of the incident. Some came all the way from Johor and Pahang to give us moral support," said Selamat, looking calm. Selamat said he was happy with all the attention given by the authorities, non governmental organisations and the media as it could help him ease his restlessness and distress. Mohd Khairul Amri has always been an ambitious aircraft engineer, according to his father. KUALA LUMPUR - Revelations that at least two people used stolen passports to board a missing passenger jet raise serious “red flags” about security at Malaysia’s main international airport, analysts and Interpol have warned. However, they cautioned against a rush to judgement, citing ongoing investigations and widespread disregard of international databases on stolen passports. Flight MH370 disappeared over the waters between Malaysia and southern Vietnam early Saturday en route from Kuala Lumpur to Beijing. No traces of the plane have been confirmed found. Malaysia has said it is looking at a possible terror motive in the plane’s disappearance after at least two people used stolen passports to pass security at Kuala Lumpur International Airport (KLIA). “It’s rather surprising but it obviously raises a red flag,” said Chris de Lavigne, an aviation and defense analyst for consultancy Frost and Sullivan. “We can’t look into this too much until further information is available, but it’s definitely a red flag,” he told AFP. Malaysia has not been the target of any notable terror attacks in recent years, but it is home to several suspected key figures in militant Islamic groups such as the al-Qaeda linked Jemaah Islamiyah. KLIA is about one hour’s drive south of the capital Kuala Lumpur and has long been considered one of Southeast Asia’s top airports. But Interpol, which maintains a database of stolen passports, said in a strongly worded statement that no one checked the database ahead of the Malaysian flight’s take-off. “Whilst it is too soon to speculate about any connection between these stolen passports and the missing plane, it is clearly of great concern that any passenger was able to board an international flight using a stolen passport listed in Interpol’s databases,” its secretary general Ronald Noble said. “This is a situation we had hoped never to see,” he said, adding that last year passengers boarded planes more than a billion times without having their passports screened against the database. The database was created in 2002 following the September 11, 2001, terrorist attacks. Kuala Lumpur International Airport has had some minor security issues before. Malaysia Airlines was fined in 2012 for allowing a Malaysian to board a flight from Kuala Lumpur to Auckland despite a directive from New Zealand officials not to check the passenger in. The airline’s check-in attendant circumvented the system by changing the passenger’s passport number, leading to the NZ$5,500 ($4,650) fine by a court in New Zealand. In 2007, a Palestinian stowaway hid in the nose wheel well of a plane, leaving Malaysian authorities puzzled how he breached airport ground security to reach neighbouring Singapore without being spotted. Malaysian authorities, left red-faced by the recent apparent security breach, have also raised questions, and immigration has launched an internal probe on the officers who did not detect the false passports. “I am still puzzled how come (immigration officers) cannot think: an Italian and Austrian but with Asian facial features,” Home Minister Zahid Hamidi said, according to national news agency Bernama. Immigration officials when contacted declined to comment. Prime Minister Najib Razak has said authorities would review “all security protocols” and enhance them “if needed”. “The security in KLIA is already compliant with international standards,” Department of Civil Aviation chief Azharuddin Abdul Rahman told reporters Monday. Kumar Ramakrishna, a security expert at Singapore’s S. Rajaratnam School of International Studies, said it should be easy for authorities to quickly access Interpol’s database. “It may not be fair to finger the whole system in place there (at Kuala Lumpur International Airport),” he said. Shukor Yusof, aviation analyst with Standard & Poor’s, has said the sheer volume of travellers moving through airports likely means not all forgeries can be caught, and stolen passports do not necessarily equate to terrorism. “To blame Malaysian authorities for this is probably unfair — they have to get it right all the time and potential hijackers just have to get through once,” he said. Relatives of Chinese passengers on the missing Malaysia Airlines flight were holding onto a “thin ray of hope” their loved ones were alive, a psychologist told AFP Monday. Fed up with awaiting word on the missing Malaysia Airlines plane, relatives of passengers in Beijing lashed out at the carrier with a handwritten ultimatum and an impromptu news conference. President Susilo Bambang Yudhoyono continues to monitor the latest development in the search for the missing Malaysia Airlines plane with seven Indonesian nationals on board, Indonesia's Antara news agency reported. A stirring video expressing love for the 239 people aboard the Malaysia Airlines MH370 flight that went missing over the South China Sea early Saturday morning has captured the attention of netizens. The oil slick found a location 20 nautical miles from one of the last known coordinates of MH370 is not from the missing airliner. A special team from China, comprising high-ranking officials, arrived here yesterday to assist in efforts to locate Malaysian Airlines (MAS) MH370 aircraft which disappeared from the radar screen on March 7. Family members of Mohd Khairul Amri Selamat are prepared to accept whatever happens to Malaysia Airlines engineer, who are among the passengers on board MAS flight MH370 that went missing last Saturday, with an open heart, regardless of him being dead or alive. A number of rescue aircraft searching for a missing Malaysia Airlines (MAS) plane spotted what looked like the tail of an aircraft in the South China Sea, but ships rushed to the spot found it to be logs tied together to form a pontoon. Malaysians continue to offer special prayers for the safety of the passengers and crew of MAS Flight MH370 which has gone missing since March 8. Eastern region enforcement chief of Malaysian Maritime Enforcement Agency (MMEA) Datuk Nasir Adam says: Tests done on sample taken from oil slick found off the coast of Kelantan is not from the missing MH370 flight but from bunkering activities. A Vietnamese rescue helicopter has retrieved a floating yellow object from the sea and determined it was not a life raft from a missing Malaysian plane, as was earlier suspected, the country’s civil aviation authority said today. Still No Sign Of Malaysian Jet Lost In "Unprecedented Mystery"
The disappearance of a Malaysian jetliner is an "unprecedented aviation mystery", a senior official said on Monday, with a massive air and sea search now in its third day failing to find any confirmed trace of the plane or the 239 people aboard. Defence Minister Datuk Seri Hishamuddin Hussein has cautioned the people not to spread unverified news of the missing Malaysian Airlines flight MH370. Vietnamese authorities are doing their best to help Malaysia in search and rescue (SAR) operations to locate the missing Malaysia Airlines (MAS) MH370 aircraft. Department of Civil Aviation (DCA) head Azharuddin Abdul Rahman said they received a report that an aircraft had seen something like an inverted life raft. Azharuddin said; "So we are contacting our counterparts, we are sending ships there to verify the object, the parts." "At the moment we have not received any report on the matter. So we are still waiting for the report," he said. [UPDATE 4.53PM] SAR area in the West Coast has been expanded. [UPDATE 4.42PM] New Zealand sent its P3 Orion vessel to help search and rescue mission. Interpol: 40 million worldwide cases of passengers travelling with false passports. Search And Rescue (SAR) coordinates will be made public soon. Hishammuddin: CCTV footage featuring passengers boarding the plane with fake passports will be released soon. Defence Minister Datuk Seri Hishammuddin Tun Hussein is pleased with the overwhelming assistance from neighbouring countries in ivestigating the missing MH370 flight mystery. THE baggage of the five passengers who were reported not aboard flight MH370 were taken off the flight before it departed, Department of Civil Aviation confirmed. The agency's Datuk Azharudin Abdul Rahman said in an earlier press conference, it is a standard operating procedure for Malaysia Airlines to remove all unaccompanied baggage (baggage of passengers not on board) before any flight takes off. “Each baggage is given a unique serial number and it is attached to the passenger’s boarding pass. This is to ensure the bags can be traced,” he said. “Every baggage will go through an X-Ray scanner to make sure it doesn't have any inappropriate items for take-off,” he added. PUTRAJAYA - The Agriculture and Agro-based Industry Ministry have deployed 1,788 fishing boats within the east and west coast of peninsula water to assist in the search and rescue mission of the missing Malaysia Airlines MH370 aircraft. Its minister Datuk Seri Ismail Sabri Yaakob said the grade C2 boats, amounting 17,880 crewmen are from Kelantan, Terengganu, Perak, Perlis and Penang. "The fishermen are expert and familiar with the areas. We wish they can give a lead to the mystery incident. "If they find anything unusual while carrying out their daily works, they can report to the relevant authorities," he told the media after visiting the families of missing passengers at Everly Hotel here today. He was speaking in reference to the statement by the Acting Transport minister Datuk Seri Hishamuddin Hussein on the discussion of deploying the fishermen to aid the mission. He also said that the ministry had also sought help from the neighbour countries, including Indonesia, Thailand and Vietnam's fisheries authorities. "We already contacted our Indonesia counterpart yesterday after the discussion with Hishamuddin while in the progress of contacting the other countries. Earlier, Ismail Sabri delivered necessary needs to the more than 100 family members who are placed at the hotel since Saturday night. KUALA LUMPUR - Malaysia said Monday there is still no trace of wreckage from a jet that vanished with 239 people on board, deepening the anguish of relatives two days after the “mystifying” disappearance. A potential breakthrough emerged Sunday when an aircraft scouring waters off southern Vietnam — part of an international search and rescue effort — spotted two objects authorities said could be debris from Malaysia Airlines flight MH370. But Malaysian authorities said there was no confirmation they came from the Boeing 777 which slipped off radar screens early on Saturday, an hour after leaving Kuala Lumpur bound for Beijing. “Unfortunately ladies and gentleman, we have not found anything that appears to be objects from the aircraft, let alone the aircraft itself,” said Malaysia’s civil aviation chief Azharuddin Abdul Rahman. “This unprecedented missing aircraft mystery — it is mystifying and we are increasing our efforts to do what we have to do,” he told a press conference. Malaysia has launched a terror probe after at least two of the passengers on board were found to have travelled on stolen passports. But Azharuddin had few answers to the burning questions surrounding the plane’s fate. Asked whether it was possible the plane had been hijacked or disintegrated mid-air, he said nothing could be ruled out. More than 150 Chinese are among the missing passengers and Beijing’s state media on Monday lashed out at Malaysia and its national carrier over their handling of the crisis. “The Malaysian side cannot shirk its responsibilities,” the Global Times newspaper, which is close to the ruling Communist Party, wrote in a scathing editorial. At a Beijing hotel, Malaysian embassy officials were processing visa applications for families wanting to take up an airline offer to travel to Kuala Lumpur to be closer to the rescue operations. Scores of relatives made their way into the room, some in groups of five or six, clutching handkerchiefs and wiping away tears from their faces. A team of Chinese officials from government ministries headed for Malaysia on Monday, tasked with investigating the incident and helping family members already there. As the search entered a third full day, other families of missing passengers gathered at a hotel in Malaysia’s administrative capital, Putrajaya, sharing breakfast as they stared intently at television news bulletins. The search effort has zeroed in on waters off the remote Vietnamese island of Tho Chu, near where two large oil slicks — suspected to be caused by aircraft fuel — as well as the suspected debris were spotted on the weekend. “All night we mobilised our most modern equipment for the search... but we found no sign of the objects,” Vice Admiral Ngo Van Phat told AFP of the hunt centred on Vietnam’s southwestern tip. Tests on the oil slick that could indicate whether it came from the missing plane could be completed by later Monday, Malaysian Maritime Enforcement Agency director general Amdan Kurish told AFP. Malaysian authorities said they were also combing waters closer to their shores, further south of Tho Chu. A total of 40 ships and 34 aircraft from an array of Southeast Asian countries, China and the United States have been involved in the search, with two Australian surveillance aircraft joining. As they scramble to discover what happened, Malaysian officials have said there was a possibility that MH370 may have inexplicably turned back towards Kuala Lumpur. Questions have also swirled over how at least two passengers boarded the jet on stolen passports, sparking an investigation into possible links with terrorism and a probe into the sale of passports in Thailand — where the documents were stolen over the past two years. Two European names — Christian Kozel, an Austrian, and Luigi Maraldi of Italy — were listed on the passenger list, but neither man boarded the plane. Malaysia’s Home Minister Zahid Hamidi reportedly said Sunday that the two passengers who did board using those passports looked Asian in appearance. “I am still puzzled how come (immigration officers) cannot think: an Italian and Austrian but with Asian facial features,” Zahid was quoted as saying by Malaysia’s national news agency Bernama. Interpol confirmed that “at least two passports” recorded in its Stolen and Lost Travel Documents database were used by passengers on the Malaysian flight. The United States has sent an FBI team to help investigate the passengers, but US officials stressed there was as yet no evidence of terrorism. Malaysia Airlines shares lost 10 percent in early trading Monday as the market reacted to the jet’s disappearance. The incident is a massive blow for the carrier which has haemorrhaged cash for several years amid mounting competition from low-cost rivals such as AirAsia. 9:30am - (UNOFFICIAL) Flight MH370 has resurfaced and landed safely in Nanming, China. Early reports say that the aircraft had experienced a cockpit electronics malfunction. As of this moment, the flight crew and all 239 passengers onboard are believed to be unharmed as some of the crew has already informed their families of their safety. Sinds vlucht MH 370 van de radar verdween, gist iedereen naar wat er heeft plaatsgevonden. Het wrak is niet gevonden, en essentiële gegevens uit de zwarte doos zijn daarom niet beschikbaar. Toch is de zwarte doos een uitstekend systeem. Dat zeggen luchtvaartkenners Benno Baksteen en Hans Heerkens in een gesprek met NU.nl. Ze erkennen dat het systeem oud is, maar benadrukken dat de zwarte doos nagenoeg altijd wordt teruggevonden, met data die bruikbaar is. "Zelfs bij de airbus A330 [ongeluk met toestel van Air France in 2009, red.] is de zwarte doos uit de oceaan opgedoken", aldus Heerkens. In het toestel van El-Al dat zich in 1992 in twee flats in de Bijlmer boorde, werd de voicerecorder - een van de twee onderdelen van de zwarte doos - van de cockpit niet teruggevonden, maar bestond de twijfel of deze überhaupt aan boord was. Zwarte dozen zijn "enorm sterk", zegt Baksteen. Ze kunnen bijvoorbeeld dertig dagen lang in zout water liggen en extreme hitte verduren zonder dat de data verloren gaat. Het wrak van een neergestort vliegtuig moet bovendien toch altijd gevonden worden, dus er hoeven ook geen extra inspanningen te worden verricht om de zwarte doos te vinden. Daarnaast benadrukken de luchtvaartkenners dat het ontzettend duur is om over te schakelen op een nieuw systeem. Op dit moment bestaat er al een datalink-systeem waarmee gegevens, bijvoorbeeld statusrapporten, met enige regelmaat elektronisch van het vliegtuig naar de grond worden verzonden. In theorie is het volgens Baksteen mogelijk dat dat systeem wordt uitgebreid tot een volledige vervanging van de zwarte doos, maar het lijkt er volgens hem niet op dat daar nu al een wens voor is. Heerkens denkt wél dat er intensief aan vervanging van het systeem wordt gewerkt. "Maar de luchtvaartsector is conservatief", aldus Heerkens: een nieuw systeem moet eerst waterdicht zijn en uitvoerig getest worden. Bepaald moet worden hoe vaak het systeem gegevens naar de grond verzendt, en welke gegevens. Vervolgens zal het systeem eerst langdurig getest worden naast het bestaande systeem. Operation Northwoods was a series of false flag proposals that originated within the Department of Defense (DoD) and the Joint Chiefs of Staff (JCS) of the United States government in 1962. The proposals, which called for the Central Intelligence Agency (CIA), or other operatives, to commit acts of terrorism in US cities and elsewhere, were rejected by the Kennedy administration. Several other proposals were included within Operation Northwoods, including real or simulated actions against various US military and civilian targets. The operation recommended developing a "Communist Cuban terror campaign in the Miami area, in other Florida cities and even in Washington". The plan was drafted by the Joint Chiefs of Staff, signed by Chairman Lyman Lemnitzer and sent to the Secretary of Defense. Although part of the US government's anti-communist Cuban Project, Operation Northwoods was never officially accepted; it was authorized by the Joint Chiefs of Staff, but then rejected by President John F. Kennedy. According to currently released documentation, none of the operations became active under the auspices of the Operation Northwoods proposals. The main proposal was presented in a document entitled "Justification for U.S. Military Intervention in Cuba (TS)," a top secret collection of draft memoranda written by the Department of Defense (DoD) and the Joint Chiefs of Staff (JCS). The document was presented by the Joint Chiefs of Staff to Secretary of Defense Robert McNamara on 13 March 1962 as a preliminary submission for planning purposes. The Joint Chiefs of Staff recommended that both the covert and overt aspects of any such operation be assigned to them. The previously secret document was originally made public on 18 November 1997, by the John F. Kennedy Assassination Records Review Board, a U.S. federal agency overseeing the release of government records related to John F. Kennedy's assassination. A total of 1,521 pages of once-secret military records covering 1962 to 1964 were concomitantly declassified by said Review Board. "Appendix to Enclosure A" and "Annex to Appendix to Enclosure A" of the Northwoods document were first published online by the National Security Archive on 6 November 1998 in a joint venture with CNN as part of its 1998 Cold War television documentary series specifically, as a documentation supplement to "Episode 10: Cuba," which aired on 29 November 1998. "Annex to Appendix to Enclosure A" is the section of the document which contains the proposals to stage terrorist attacks. The Northwoods document was published online in a more complete form, including cover memoranda, by the National Security Archive on 30 April 2001. Since it would seem desirable to use legitimate provocation as the basis for U.S. military intervention in Cuba a cover and deception plan, to include requisite preliminary actions such as has been developed in response to Task 33 c, could be executed as an initial effort to provoke Cuban reactions. Harassment plus deceptive actions to convince the Cubans of imminent invasion would be emphasized. Our military posture throughout execution of the plan will allow a rapid change from exercise to intervention if Cuban response justifies. Start rumors (many). Use clandestine radio. Land friendly Cubans in uniform "over-the-fence" to stage attack on base. Sabotage ship in harbor; large fires—naphthalene. Sink ship near harbor entrance. Conduct funerals for mock-victims (may be in lieu of (10)). United States would respond by executing offensive operations to secure water and power supplies, destroying artillery and mortar emplacements which threaten the base. Commence large scale United States military operations. We could blow up a drone (unmanned) vessel anywhere in the Cuban waters. We could arrange to cause such incident in the vicinity of Havana or Santiago as a spectacular result of Cuban attack from the air or sea, or both. The presence of Cuban planes or ships merely investigating the intent of the vessel could be fairly compelling evidence that the ship was taken under attack. The nearness to Havana or Santiago would add credibility especially to those people that might have heard the blast or have seen the fire. The United States could follow up with an air/sea rescue operation covered by U.S. fighters to "evacuate" remaining members of the non-existent crew. Casualty lists in U.S. newspapers would cause a helpful wave of national indignation. The terror campaign could be pointed at refugees seeking haven in the United States. We could sink a boatload of Cubans en route to Florida (real or simulated). We could foster attempts on lives of Cuban refugees in the United States even to the extent of wounding in instances to be widely publicized. Exploding a few plastic bombs in carefully chosen spots, the arrest of Cuban agents and the release of prepared documents substantiating Cuban involvement, also would be helpful in projecting the idea of an irresponsible government. A "Cuban-based, Castro-supported" filibuster could be simulated against a neighboring Caribbean nation (in the vein of the 14 June invasion of the Dominican Republic). We know that Castro is backing subversive efforts clandestinely against Haiti, the Dominican Republic, Guatemala, and Nicaragua at present and possible others. These efforts can be magnified and additional ones contrived for exposure. For example, advantage can be taken of the sensitivity of the Dominican Air Force to intrusions within their national air space. "Cuban" B-26 or C-46 type aircraft could make cane-burning raids at night. Soviet Bloc incendiaries could be found. This could be coupled with "Cuban" messages to the Communist underground in the Dominican Republic and "Cuban" shipments of arm which would be found, or intercepted, on the beach. Use of MIG type aircraft by U.S. pilots could provide additional provocation. Harassment of civil air, attacks on surface shipping and destruction of U.S. military drone aircraft by MIG type planes would be useful as complementary actions. An F-86 properly painted would convince air passengers that they saw a Cuban MIG, especially if the pilot of the transport were to announce such fact. The primary drawback to this suggestion appears to be the security risk inherent in obtaining or modifying an aircraft. However, reasonable copies of the MIG could be produced from U.S. resources in about three months. It is possible to create an incident which will demonstrate convincingly that a Cuban aircraft has attacked and shot down a chartered civil airliner en route from the United States to Jamaica, Guatemala, Panama, or Venezuela. The destination would be chosen only to cause the flight plan route to cross Cuba. The passengers could be a group of college students off on a holiday or any grouping of persons with a common interest to support chartering a non-scheduled flight. Take off times of the drone aircraft and the actual aircraft will be scheduled to allow a rendezvous south of Florida. From the rendezvous point the passenger-carrying aircraft will descend to minimum altitude and go directly into an auxiliary field at Eglin AFB where arrangements will have been made to evacuate the passengers and return the aircraft to its original status. The drone aircraft meanwhile will continue to fly the filed flight plan. When over Cuba the drone will begin transmitting on the international distress frequency a "MAY DAY" message stating he is under attack by Cuban MIG aircraft. The transmission will be interrupted by destruction of the aircraft which will be triggered by radio signal. This will allow ICAO radio stations in the Western Hemisphere to tell the United States what has happened to the aircraft instead of the United States trying to "sell" the incident. Approximately 4 or 5 F-101 aircraft will be dispatched in trail from Homestead AFB, Florida, to the vicinity of Cuba. Their mission will be to reverse course and simulate fakir aircraft for an air defense exercise in southern Florida. These aircraft would conduct variations of these flights at frequent Intervals. Crews would be briefed to remain at least 12 miles off the Cuban coast; however, they would be required to carry live ammunition in the event that hostile actions were taken by the Cuban MIGs. Twelve of these proposals come from a 2 February 1962 memorandum entitled "Possible Actions to Provoke, Harass or Disrupt Cuba," written by Brig. Gen. William H. Craig and submitted to Brig. Gen. Edward Lansdale, the commander of the Operation Mongoose project. The memorandum outlines Operation Bingo, a plan to; "create an incident which has the appearance of an attack on U.S. facilities (GMO) in Cuba, thus providing an excuse for use of U.S. military might to overthrow the current government of Cuba." It also includes Operation Dirty Trick, a plot to blame Castro if the 1962 Mercury manned space flight carrying John Glenn crashed, saying: "The objective is to provide irrevocable proof that, should the MERCURY manned orbit flight fail, the fault lies with the Communists et al. Cuba [sic]." It continues, "This to be accomplished by manufacturing various pieces of evidence which would prove electronic interference on the part of the Cubans." Even after General Lemnitzer lost his job as the Chairman of the Joint Chiefs of Staff, the Joint Chiefs of Staff still planned false-flag pretext operations at least into 1963. A different U.S. Department of Defense policy paper created in 1963 discussed a plan to make it appear that Cuba had attacked a member of the Organization of American States (OAS) so that the United States could retaliate. The U.S. Department of Defense document says of one of the scenarios, "A contrived 'Cuban' attack on an OAS member could be set up, and the attacked state could be urged to take measures of self-defense and request assistance from the U.S. and OAS." The plan expressed confidence that by this action, "the U.S. could almost certainly obtain the necessary two-thirds support among OAS members for collective action against Cuba." Any of the contrived situations described above are inherently, extremely risky in our democratic system in which security can be maintained, after the fact, with very great difficulty. If the decision should be made to set up a contrived situation it should be one in which participation by U.S. personnel is limited only to the most highly trusted covert personnel. This suggests the infeasibility of the use of military units for any aspect of the contrived situation." The U.S. Department of Defense report even suggested covertly paying a person in the Castro government to attack the United States: "The only area remaining for consideration then would be to bribe one of Castro's subordinate commanders to initiate an attack on [the U.S. Navy base at] Guantanamo." The continuing push against the Cuban government by internal elements of the U.S. military and intelligence communities (the failed Bay of Pigs Invasion, the Cuban Project, etc.) had already prompted President John F. Kennedy to attempt to rein in burgeoning hardline anti-Communist sentiment that was intent on proactive, aggressive action against communist movements around the globe. After the Bay of Pigs, Kennedy had fired CIA director Allen W. Dulles, Deputy Director Charles P. Cabell, and Deputy Director Richard Bissell, and turned his attention towards Vietnam. Kennedy had also stripped the CIA of responsibility for paramilitary operations like the Bay of Pigs and turned them over to the U.S. Department of Defense and the Joint Chiefs of Staff, which, as Commander in Chief, Kennedy could more directly control. Personally, Kennedy's attempt to curtail the CIA's extensive Cold War and paramilitary operations was a direct expression of this concern. Kennedy personally rejected the Northwoods proposal, and it would now be the Joint Chiefs' turn to incur his displeasure. A JCS/Pentagon document (Ed Lansdale memo) dated 16 March 1962 titled MEETING WITH THE PRESIDENT, 16 MARCH 1962 reads: "General Lemnitzer commented that the military had contingency plans for U.S. intervention. Also it had plans for creating plausible pretexts to use force, with the pretext either attacks on U.S. aircraft or a Cuban action in Latin America for which we could retaliate. The President said bluntly that we were not discussing the use of military force, that General Lemnitzer might find the U.S so engaged in Berlin or elsewhere that he couldn't use the contemplated 4 divisions in Cuba." The proposal was sent for approval to the Secretary of Defense, Robert McNamara, but was not implemented. Following presentation of the Northwoods plan, Kennedy removed Lemnitzer as Chairman of the Joint Chiefs of Staff, although he became Supreme Allied Commander of NATO in January 1963. American armed forces leaders began to perceive Kennedy as going soft on Cuba, and the President became increasingly unpopular with the military, a rift that came to a head during Kennedy's disagreements with the service chiefs over the Cuban Missile Crisis. On 3 August 2001, the National Assembly of People's Power of Cuba (the main legislative body of the Republic of Cuba) issued a statement referring to Operation Northwoods and Operation Mongoose wherein it condemned such U.S. government plans. WW3 FALSE FLAG HAS HAPPENED! Who was on the Malaysian plane? Why was it taken down? Where do we go from here? DOD CONNECTION FOUND! Believe it or not, something is going on with Malaysian Airlines flight MH370. Now we just need to dig deeper. We can do it GLP! Don't forget about Operation Northwoods! "Last known data from #MH370 showed jet on heading of 333°, air speed of 270 kts at altitude of 2,400 ft. Something clearly wrong there." It seems as though two European citizens had their passports stolen, and those passports were used to board the plane. The two are safe, but who used their passports? Thread: 2 people listed as passengers on missing Malaysia Airlines plane were not on board, Austrian and Italian officials say. About 20 top management staff from semiconductor company Freescale Semiconductor were among 38 Malaysians onboard MAS flight MH370 which went missing over Vietnam-controlled airspace early today. AUSTIN, Texas--(BUSINESS WIRE)--Mar. 3, 2014-- Freescale Semiconductor (NYSE: FSL), a global leader in radio frequency (RF) power transistors, today announced the availability of 11 new commercial RF power LDMOS products that can meet the requirements of U.S. defense electronics applications. This is the first set of products released as part of the company’s strategic defense initiatives for its RF power business, announced in June 2013. Kinga has posted a thread, check it out here: Thread: WW3 FALSE FLAG HAS HAPPENED! Who was on the Malaysian plane? Why was it taken down? Where do we go from here? DOD CONNECTION FOUND! , with a very interesting find. "An American national working for IBM in Malaysia has been identified as one of the passengers traveling on board the Malaysian Airlines plane that vanished off the coast of Vietnam as new information concerning stolen passports has raised fears that it may have been an act of terror." Think outside the box. The Chinese or Russians hijacked this plane to capture the American computer geeks who know deep tech secrets. A crash was simulated by a Russian or Chinese sub dumping litres of jet fuel and hydraulic oil and debris. Our greatest western tech secrets are now being revealed. SEPANG: A BOEING 777 pilot, who was flying 30 minutes ahead of the missing Malaysia Airlines aircraft, said he established contact with MH370 minutes after he was asked to do so by Vietnamese air traffic control. "If the plane was in trouble, we would have heard the pilot making the Mayday distress call. But I am sure that, like me, no one else up there heard it. A video clip showing the family member dialing the number made its rounds online on Sunday. The call got connected, but no one picked up. The Chinese media also reported that a man successfully made a call to the mobile phone of his elder brother, who is a MH370 passenger. He made a total of three calls, but no one answered. The man, who spoke to reporters at a Malaysia Airlines briefing in Beijing, was not named. Irony = Using hijacked flight 370 to nuke the NSS conference in the Netherlands. It is not hard to make a plane disappear. Just kill the transponder so the passive radar does not see the flight anymore. Make sure the blackbox is inop and land the aircraft on one of the abandonded airfields in Vietnam. The 20 passengers from the company Freescale Semiconductor from Austin Texas could pull that off. Retrofit the B777 with a nuke and wait for Obama and a crapload of other politicians to be at the NSS and drop the plane with nuke right in the middle of it. Blame China or Russia and WW3 is here. Messed up thing about it is that I am only 50 kilometers away from the NSS conference. If Obama cancels his visit to the Netherlands, I am getting the freck out of the country. The 'unprecedented mystery' behind the disappearance of Malaysian Airlines flight MH 370 deepened on Monday when relatives claimed they were able to call the cellphones of their missing loved ones. According to the Washington Post, family of some of the 239 people on board the vanished Boeing 777 said that they were getting ring tones and could see them active online through a Chinese social networking service called QQ. One man said that the QQ account of his brother-in-law showed him as online, but frustratingly for those waiting desperately for any news, messages sent have gone unanswered and the calls have not been picked up. He was a 19-year-old Iranian asylum seeker called Pouiria Nur Mohammad Mehrdad who was trying to meet his mother in Germany. 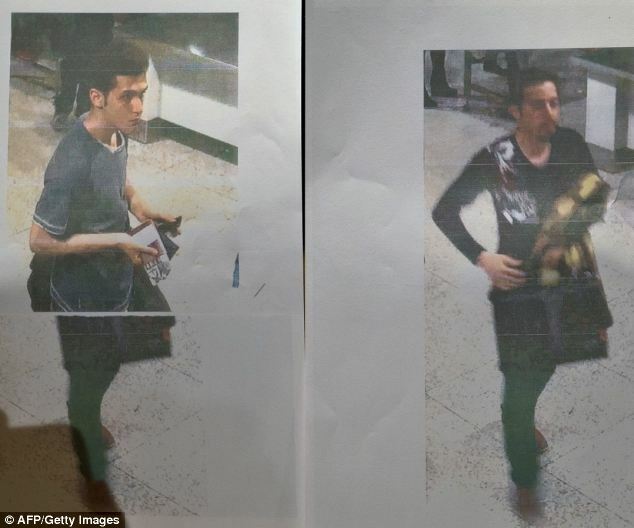 The two men who travelled on the doomed Malaysian Airlines flight from Kuala Lumpur to Beijing on stolen passports. The younger man (left) was identified as Pouiria Nur Mohammad Mehrdad, 19, said by police in Malaysia to be an Iranian asylum seeker on his way to Germany to meet his mother. The older man (right) remains unknown. Met welke bedoeling is dat gedaan?, slaat nergens op die foto m.i.